Republican vice presidential nominee Mike Pence speaks during the vice presidential debate at Longwood University in Farmville, Va., on Oct. 4, 2016. We all knew Mike Pence was a rapper, but who knew he dipped into reggae? Tuesday night’s vice presidential debate featured the Republican employing the Shaggy defense, denying everything that running mate Donald Trump ever said. Democrat Tim Kaine, for his part, knew his job going into the debate. No one cares what the vice presidents think or say, and unless your name is Dan Quayle or Sarah Palin, a vice president usually can’t really help or hurt the top of the ticket. Kaine rushed into the debate like a suburban Little League coach arguing every call on behalf of his daughter. His goal was to make Pence answer for every terrible thing that Trump has ever said, and Pence just denied everything. 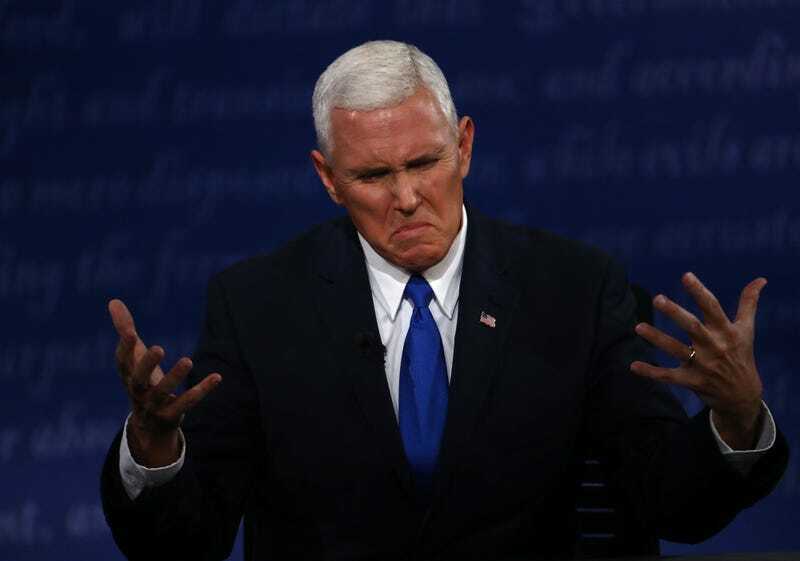 I’m pretty sure that by the end of the night, Pence was denying that he was governor of Indiana or that his name was even Mike Pence. While many political pundits declared Pence the “winner” because he appeared calm and steady during the debate, he lost the overall war by providing the Hillary Clinton campaign with enough material to create an anti-Trump mixtape from his own vice presidential pick. In fact, before the debate was even over, the Clinton campaign had released a video contrasting every Pence denial with Trump saying and doing exactly what had just been denied. Kaine may sound like a suburban youth pastor in dad jeans who hums over the curse words when he’s singing along with the radio, but he knows how to generate some viral video. His suicide pact with Clinton to damage his nice-guy brand in order to trick Pence into a supercut of the Shaggy defense worked beautifully. How bad was it? Reports from the Trump campaign are that the top of the ticket is unhappy with Pence’s defense of his running mate. Worse, many analysts (myself included) believe that Pence was foot-dragging in defending Trump because he’s angling to be the GOP nominee in 2020 and doesn’t want to be seen as being too deep in the tank for the bombastic billionaire. On the Clinton side, this is a victory of sorts. Kaine did his job, and now he can fade back into obscurity wandering the mall kiosks next to Orange Julius and wondering why his daughters want a bedazzled cellphone case. Clinton has first lady Michelle Obama, President Barack Obama, Vice President Joe Biden and Massachusetts Sen. Elizabeth Warren to do her heavy lifting as surrogates in the campaign. In the end, no one will remember this vice presidential debate; Clinton and Trump have such huge personalities that the town hall debate on Sunday will overshadow anything that happened at Longwood University in Farmville, Va. However, in the short term, this is another victory for the Clinton campaign because she, with help from Kaine and Pence, turned a 90-minute debate into 24 hours of negative news coverage for Trump.